This my first attempt at building (and flying) a PSS model so here goes, warts and all. 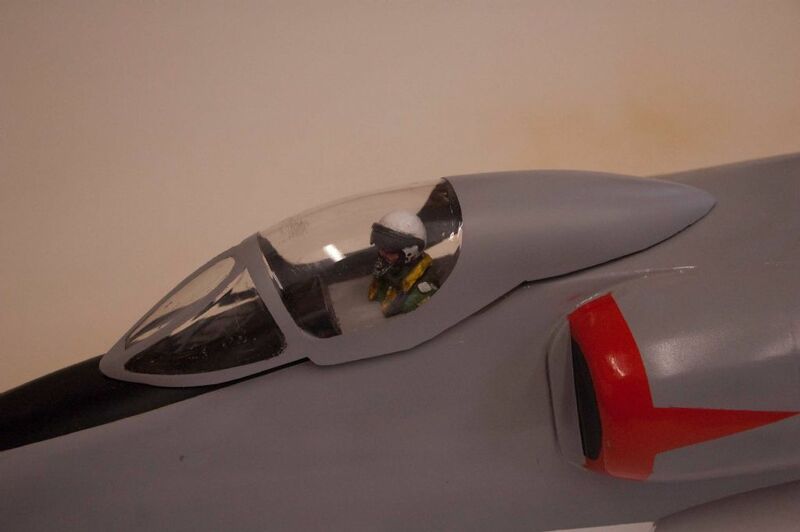 I am loosely modelling my Skyhawk on VA 153, above, partly because the colour scheme is fairly simple for me to cut my teeth on and partly because my wife likes the "pretty blue" tail. I wont be detailing the build as Phil and others are already doing a better job than I could achieve but I'll share progress at various stages and give some detail of techniques which are, for me at least, new. 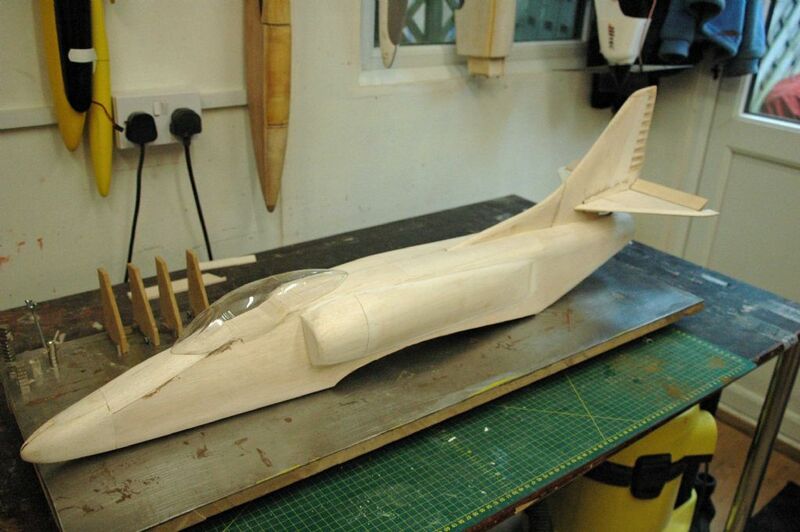 The fuselage is largely complete, it just needs final sanding to shape around the air intakes and a fine rubbing down. 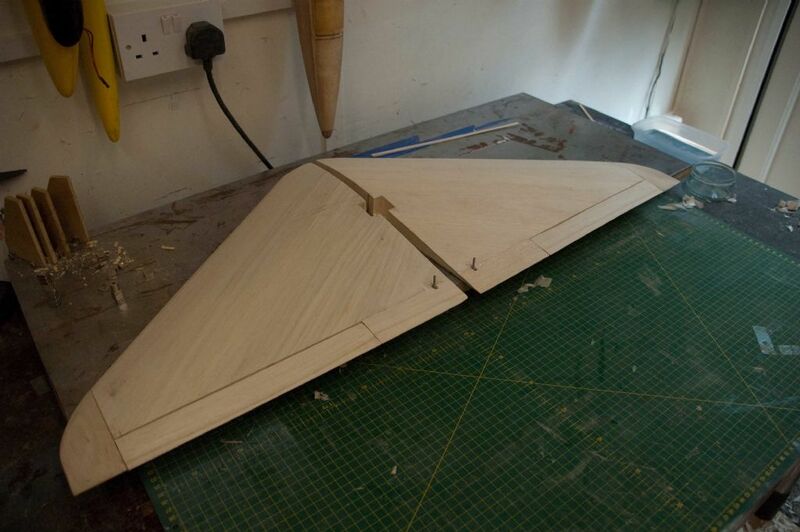 The fin, tail plane and elevator are not yet glued in, I'm going to cover them first. Same with the canopy. This weekend I plan to start covering the parts with glass tissue and polyurethane resin. I have always used epoxy/glass in the past but I can see some advantages in using water based PU so we'll see how it goes. Another first for me! Started the covering process today. I'm using 24g glass fabric and PolyC water based polyurethane resin. I started with the tailplane as it is small and simple and I could practice with PolyC before moving on to bigger parts. 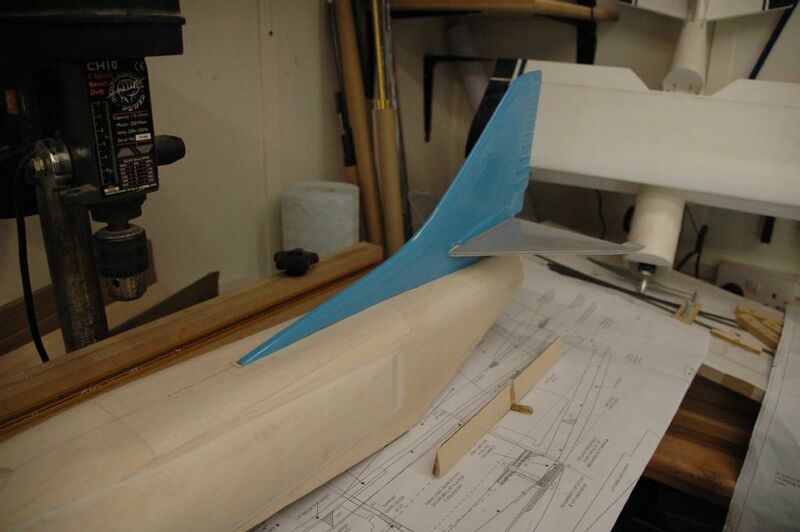 I first primed the tailplane with a light coat of PolyC all over and allowed it to cure - 30 minutes. Then applied glass to the under side, wet it out and allowed it to cure. Then a third coat before cutting back the excess cloth. I repeated the process on the upper side then gave the whole tailplane a further coat of PolyC. The result is very good. Not as tough as epoxy but hard and smooth. I now have to fill the cloth weave with more coats of PolyC. I have seen references to colouring PolyC with powder paint to avoid a separate paint job so I will give this a try - on a test panel first! All I would say Stephen is that if the balsa is little thinner, the water based resin and cloth will warp it (like tissue and dope). You have probably got away with it because it is 3/8ths thick, but I have had problems with warping before, so I will pin each covering down whilst it dries. I have read elsewhere about the warping problem. Apparently the secret is to seal the balsa with a thin coat of PU first, which is what I did. Presumably it stops any further water being absorbed? 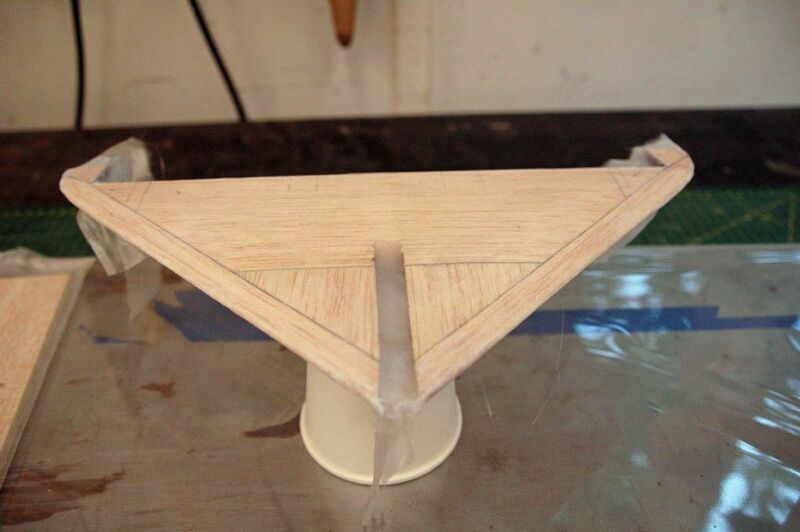 I didn't really mention it but before I covered the tail I covered a test panel - 4" x 10" of 3/32 balsa, one side only. Partly because I want a panel to experiment with when pigmenting the PU and partly to check out the warping issue. The panel wasn't held flat in any way and has remained perfectly flat. It is a lot stiffer now, especially across the grain. I'm not sure that PU is better than epoxy overall. It is certainly easier to use - one pack so no mixing, easy to clean up and a 30 minute cure time but I will need about 8 coats in total and it is not as tough. I'm weighing the tail as I go so will end up with a weight per m2. It will be interesting to see how it compares on the weight front. Making good progress with my Sky Hawk. I finished covering the fin and tail plane with WBPU / glass cloth and I'm pleased with the result. It took 7 coats of PU in total to achieve a smooth finish but it went on very quickly and seems hard and tough. I did try colouring the PU with powder paint but the results where disappointing. The coating was rough to the touch and the opacity was poor = more coats = more weight. So I resorted to aerosol spray paint instead. Total weight came out at just over 100 g/m2 so heavier than profilm but lighter than epoxy/glass/paint. It is starting to look the part! The wing halves are finished - built exactly as the plans and with no issues. Tomorrow I'll try to find time to join the halves. HI Stephen, Really looking the part as you say - I love the blue fin! Is your pilot one of the 3D printed ones or homemade or store bought? Looks like a very neat and tidy build that Stephen - lovely job! Good to read the build has gone well, to plan! I bought the pilot online from Real Model Pilots. I assume that it is 3D printed and the detail is great. It is their 1/12 scale jet pilot bust. I cheated and bought mine ready painted. This looks absolutely great. Very nice indeed. Also very interested to read more about your experiences with PU, so please let us know if any problems encountered. I was going to cover my A4 with film, but as I have 25g cloth and Poly C, I may go down that route instead. I've only ever used the cloth for strengthening repairs previously so this would be another first for me, but I'm looking forward to it. I joined the wing halves over the weekend. No real problems except that the laser cut dihedral brace was to small, in the vertical height, and so was too short to pass through the entire wing including upper and lower skins. Not a problem - I just made a new one from ply. So the build process is complete. Now on to covering and painting. I am thinking of buying some decent spray equipment instead of using aerosol paint. Can anybody advise on what equipment others use for painting PSS models please. I assume an airbrush and compressor? If so what type of airbrush, nozzle size etc? If not an airbrush then what other equipment do people use? Looks great that Steve, very nice! Another A-4 is born! I can't personally recommend an airbrush but I'm sure others that use them regularly on here (like Andy Meade or Mark Kettle) will pipe up soon and be able to advise. To date, on my models that have been sprayed, I've always had to rely on careful masking and I then just used car rattle cans... its inefficient and expensive on paint due to the amount of overspray and waste, hence the importance of good masking, but the finish is acceptable. With an airbrush of course you will use less paint and be able to deliver is where you want it with precise accuracy. Are you spraying the entire top sides grey and the undersides white?? Maybe rattle cans are ok for these larger areas and relatively simple masking? Looking great there. I've sprayed a fair few PSS models now, and fine-tuned my kit to match my (mediocre) skills, and acceptable (to me) finish. This sort of gun is fine. They can be tuned down to spray fine lines, are easy to clean, are cheap, and spares are cheap too. I messed around with 3 or 4 different airbrushes in the past, and none of them were that great. This gun can be cleaned under a tap with water when using water based acrylic and will last a long time. I still keep a cheapo chinese airbrush for doing very fine edges or weathering, but wouldn't bother for area coverage. I use a compressor like this, but not this actual one. I think mine has a 60 litre tank, but the important thing is that it has a regulator. You don't want to shoot acrylic (or enamel) at full on 120+psi. It goes grainy and very rough otherwise. Paint - I use water based acrylic from here. UA mimetic seems very sprayable, and can be thinned with a few drops of water for not much loss in coverage. Beware of some of the colours having a skin like custard in them. You don't want this in your airbrush mid-spraying. I always used to use enamels, and for big aircraft I still would. It's a pain to clean and thin (needs acetone) but the finish is much more hardy. I also source 2k two part primer from ebay for big stuff, and you want a very good mask for that as it is not very lung friendly. Finishing I'd recommend Halford's satin or matt lacquer. Spray it on in several thin layers though. Also with rattle cans, I usually dunk them in a sink full of the hottest water your home boiler can produce. This raises the pressure and thins the paint so it comes out in a better mist. Be careful doing that bit though, don't want to exceed the pressure / thermal limit of the rattle can. I was thinking airbrush but from what you are saying a small spray gun would be better for the relatively large areas of single colour on the Sky Hawk. Makes sense. I have one eye on the future though. I have enjoyed the Sky Hawk build so much that I am planning to build further PSS models. May be a Jet Provost next? I fancy a go at a more detailed, intricate colour scheme so that is part of the airbrush question. May be spray gun and airbrush, I'll need a bigger workshop! 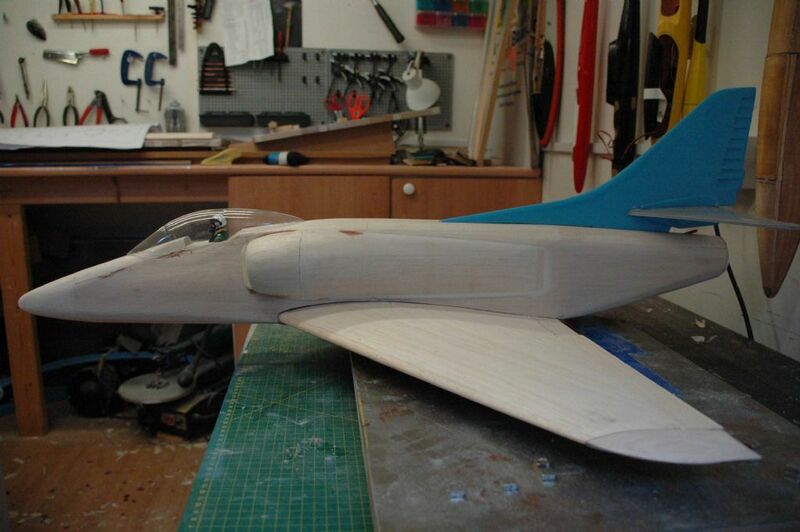 No progress on my Sky Hawk for the last month due to holidays but I'm back in the workshop now. 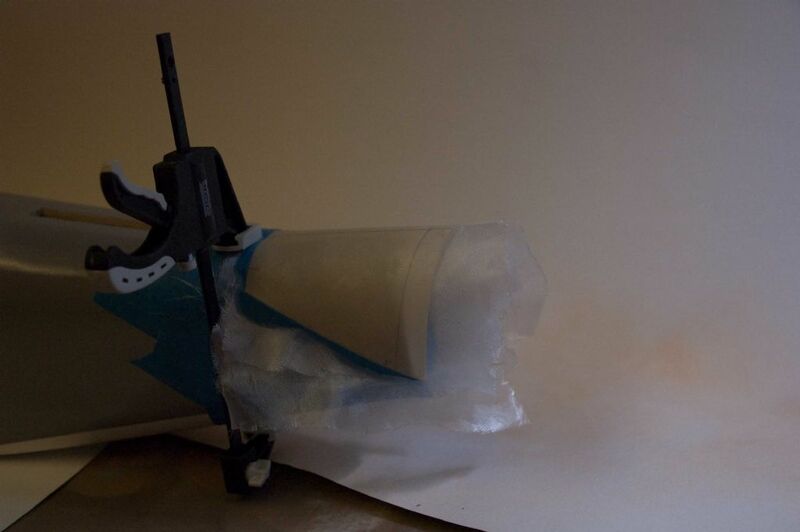 I covered the wing and fuselage completely in one day using Poly-C and glass cloth. That stuff really goes on quickly in warm weather. No problems with warping / distorting of the parts - so far so good. Today I have given the fuselage a first spray coat of primer filler. It's suppressing how it has showed up slight imperfections in my sanding and filling which weren't obvious before hand. Hopefully more elbow grease and another coat of primer will cure that????? 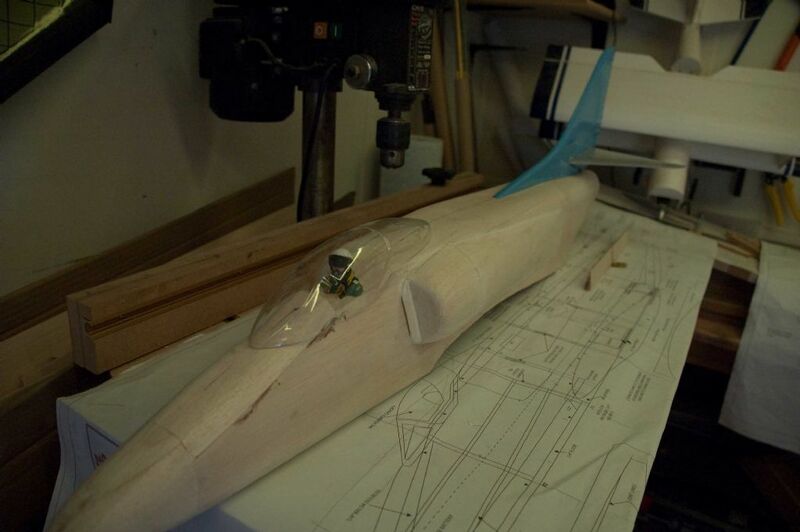 The fuselage is now sprayed and awaiting decals and detail. I have had my first serious problem with build so far. I prepared, masked and sprayed the vac formed canopy with car body aerosol paint from Halfords. Once dried I found that the adhesion of the paint to the plastic was almost zero. Some of the paint flaked off as I removed the masking tape. Have any of you any advice on how to successfully paint the canopy? Any special surface preparation or paint to use? On canopies (and any other plastic mouldings and fiberglass parts) I have used Halfords gray plastic primer spray cans. Not had any issues and one nice touch is that the canopy frame on the "inside" ends up gray even when you apply a light coloured top coat. I've been able to spray Halfords spray can top coats on this as well as Humbrol enamels without any flaking problems. As above from John - try and use a plastic primer there. Once the clear bits have been masked off, you could also try a quick wipe with prymol, as it's supposed to key any plastic surface, but I'd still hit it with a plastic primer next. I did as you suggested and, second time around, all is well. Just need to clean off the masking tape adhesive when the paint is fully hardened. 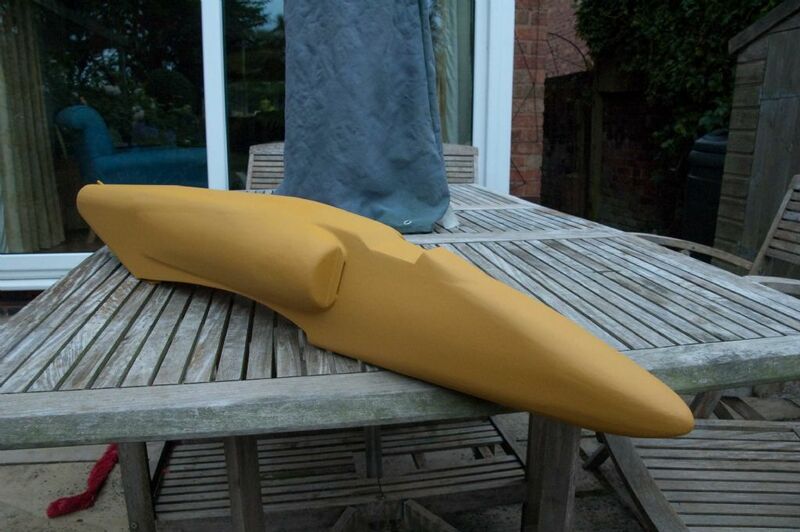 I have put off making the exhaust cowling long enough so this morning I made a start. I'm having a bash at an epoxy / glass moulding. First I made an oversize cowling from poster board with tabs on both edges and the front edge. This will end up as the core in sandwich construction. Then I taped in place on the fuselage with masking tape on the tabs. The three layers of 25g glass cloth laid up in a minimum amount of epoxy. Once it has cured I shall remove the moulding and apply one, may be two layers of glass / epoxy to the inside surface.